I’d like to make it clear right off the bat that I’m no expert on cat food at all. 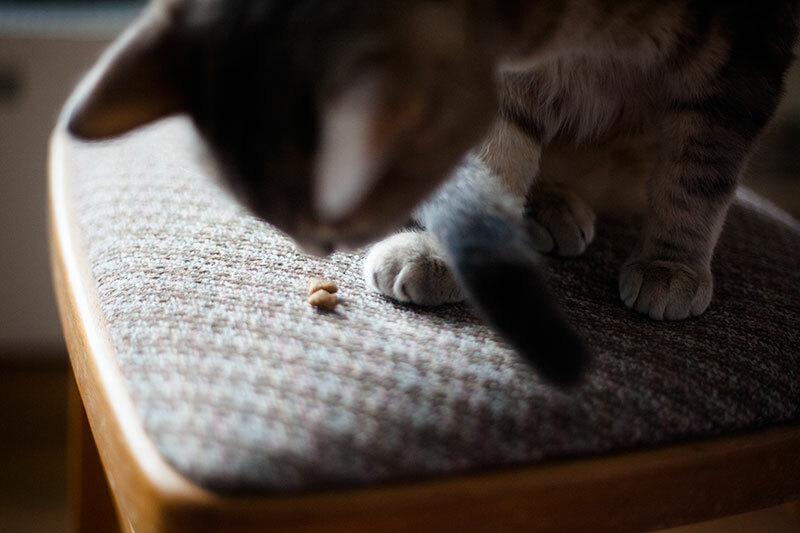 When selecting a cat food, on the rare occasion I feel like I need to switch, I do my best to follow two rules of thumb: I try not to buy foods that are high in sugar, and (since I feed kibble) I try to buy foods that are relatively high in protein. Beyond that, I readily admit, I’m not the most knowledgeable person on this topic at all. 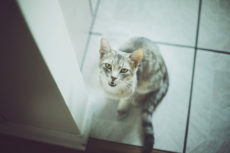 I say this at the start because, while I have had firsthand experience with my little furball at home developing digestive issues/sensitive stomach problems before, and I would like to share my experience in case it can help anyone out, I also don’t want to pretend I’m any kind of a guru on this topic. I’m not a vet, pet care health professional, I’m not a feline nutritionist, I have no expertise whatsoever: so please take my advice with a bucket full of salt, and more or less just a rundown of the things I’ve thought about and done in the past. Get approval from your vet if you’re considering experimenting with a different cat food, and absolutely – especially if your cat is vomiting more than once a week – get on the phone and tell your vet what’s up in case there’s an underlying disease causing your cat’s sensitive stomach. Now that the qualifiers are (mostly) out of the way, let me start at the beginning of my story. Throughout my time as a cat mamma (5 years so far!) I seem to have stuck to a basic rule when it comes to food. If ever I had issues with a commercial food, if it was not a health-related issue, I would switch Avery onto a different formula, but by the same brand. So when I couldn’t stand the stinky litter Avery left for me back in Canada, I switched him from Blue’s Chicken & Brown Rice to Blue’s Salmon & Brown Rice (which resolved the stench, by the way), since Blue products were working out well for him (his coat was shiny, he never had any health issues, he was great). 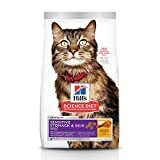 I’ve heard that you should feed cats food from different protein sources as well, so while I’ll feed main meals in one protein source (like salmon), I’ll typically feed snacks in a different protein (like chicken), but again, by the same brand. This method hasn’t ever really failed me, but back when Thomas and I moved with Avery to the UK in 2016, we had no real choice but to switch from Blue to another brand of cat food, since Blue products weren’t affordably available here. We immediately put Avery on a high-end grocery store brand, and he did wonderfully on it, absolutely adoring the cat food, had a gorgeous shiny coat, was healthy and perfect. Everything went swimmingly until many long months later (maybe 6 or even a year?). He developed an issue where, once in a blue moon, he’d throw up bile on an empty stomach – usually in the morning or evening right before he was about to eat. A quick Google search told me the immediate fix to my problem was to feed Avery more frequently throughout the day. Since Thomas and I are lucky enough to work from home, this new regular feeding schedule was not a problem. The the throwing up bile issue (as infrequent as it was) immediately stopped. Still, the idea that the cat food we had could be less than optimal for Avery, and that it may have been making his stomach too acidic, nagged at me. He also had somewhat soft stools rarely, and while that wasn’t an issue I was dying to fix, it would be a perk if I could also resolve this. I began looking for a food that claimed to fix sensitive stomach issues. Which cat food did I end up with? Royal Canin’s Sensible Digestion 33. 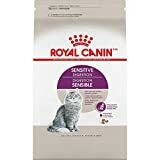 I chose it primarily because back in Canada, Royal Canin was the cat food always displayed in vets’ offices, and was recommended by so many different pet care professionals to me I lost track. It seemed like a high quality pet food brand (I think it is, correct me if I’m wrong! ), and since I find it’s affordable enough for me, I figured it was the right choice. Now that I’ve done a little more research and asked a few more vets, I’ve heard that Hill’s is another excellent choice for high quality cat food. Had I known more about Hill’s before, I may have opted for their Sensitive Stomach & Skin Cat food, but I wouldn’t switch Avery now since Royal Canin’s been so great for him, and I have that (possibly weird) rule that I switch within the same brand so long as things are going well. 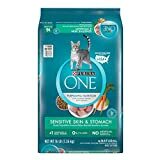 I have actually changed Avery off the Sensitive 33 food – months to maybe a year after the sensitive stomach issues disappeared. He’s now on an indoor cat food – this one in particular, because he’s a particularly lazy cat and I wanted to see if it would help him stay “regular” in the loo department when he was refusing to put in much exercise. This new cat food has worked out well for him, though again, I urge you to take absolutely all my experiences and thoughts with a pinch of salt, since #1 – I am not an expert, #2 – I may be getting quite a lot of things wrong, and #3 – even if something’s worked out for Avery, my guess is formulas have different effects on different cats. Nonetheless, I did want to share my experiences. 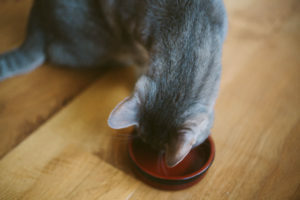 In the remainder of this article, I’ve compiled a list of some of the most popular sensitive stomach cat foods you can find floating around. You are 100% correct in thinking that popular does not necessarily mean better. That being said, I do like to start off with bestseller lists when hunting for products to try, including cat foods, because I feel it’s really beneficial to sift through as many reviews as possible before making a decision on what to buy. Reading through reviews also helps me know what issues have cropped up with other pet owners who have tried using the product, and can thus guide me in what to keep an eye out for if I do eventually give that product a go myself. I also feel like a bestseller list for something so specific as pet foods intended to resolve digestive issues, vomiting on an empty stomach, or soft stools, are likely more representative of good products than standard cat food bestseller lists. Because if you have the problem, you switch to the new cat food, and that problem is either fixed or is not, leading you to give the product either a good or bad review. The positive change or lack there of is an obvious sign things are working out or have stayed the same. 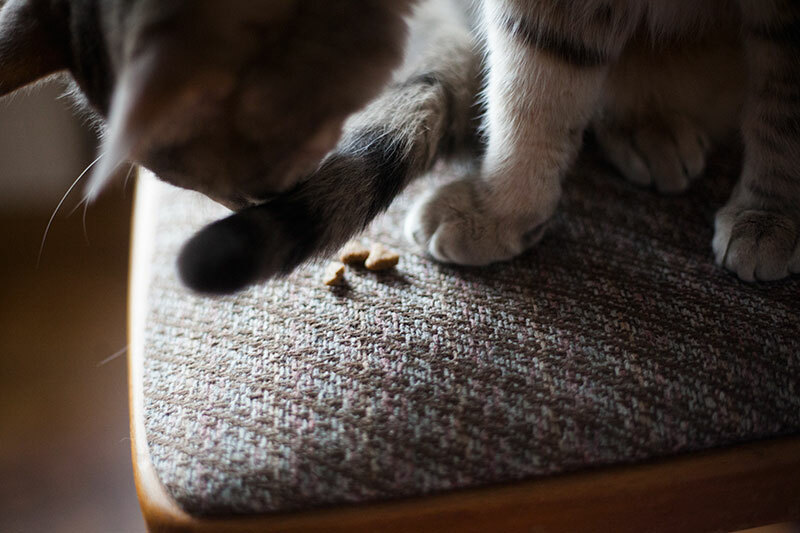 By contrast, if you switch to a different regular cat food that’s not intended to fix a particular problem, it can be hard to find evidence to point out that clearly shows whether the new food is good or bad, or much the same, compared to the old. Again – absolutely always do your due diligence. Let your vet know about your cat’s symptoms before taking matters into your own hands, discuss possible options with them before making the choice to switch. Also a reminder – do transition your cat to any new food gradually. 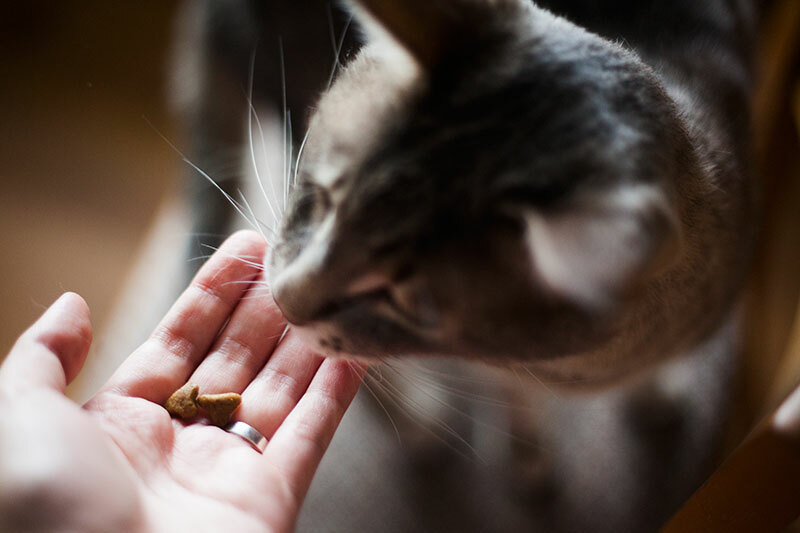 Have a bag of the old cat food on hand just in case things turn out worse, and watch your pet for symptoms that may crop up especially in the first couple weeks after the change. For obvious reasons, I’ve split this article into wet food and dry food sections. 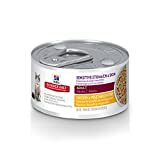 I did my best to find as many quality wet foods for cats with sensitive stomachs as I could, but there didn’t seem to be many options. 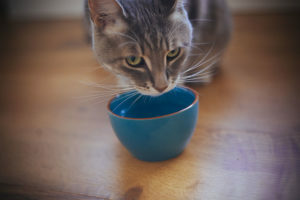 If you in any way are struggling to get your cat to drink enough water on kibble, give these techniques a go. I’m lucky enough to never have had the problem, as if I replace Avery’s water with fresh water, he’ll immediately drink, and he even meows at his water mug so I can change it for him when he wants, which usually ends up being around 2-3 times a day. Marketed as being an adult-only cat food for felines with sensitive stomachs or sensitive skin. Hills states their cat foods contains clinically proven antioxidant blend, and that this and vitamins C and E help support a healthy feline immune system. It’s marketed as being made with high quality ingredients that are easy to digest, have no artificial colours, flavours, or preservatives. 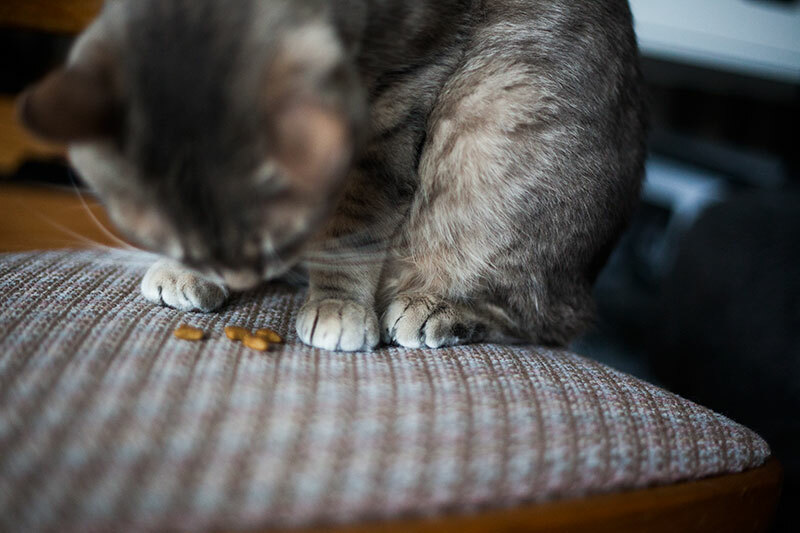 Royal Canin markets their sensitive stomach cat food as being specially formulated with highly digestible proteins. This cat food is also supposed to help prevent soft stools, promote intestinal flora balance, and promote “good” bacteria development. It’s one cat food formula to my knowledge, but comes with three distinct kibble shapes in the bag, which I can attest to being quite interesting to look at. Apparently this is supposed to help stimulate a cat’s appetite, so this may be a good option for cats who are fussy about what they eat as well as having stomach issues. Avery took to this cat food immediately, but he’s never been the most fussy about kibble, so make of that what you will. 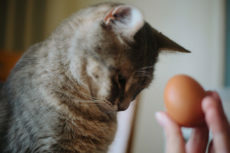 Purina markets their sensitive cat food as being ideal for both cats with sensitive stomach and sensitive skin issues. Their formula is supposedly extremely digestible, has real turkey is the #1 ingredient, and has no unnecessary fillers. Advertised as being a complete and balanced nutritional diet for adult cats, with crunchy textures for felines who are fussy with eating. I think the main difference between this Purina cat food and the last is the main ingredients. 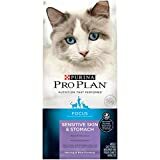 The Purina Pro Plan Focus Sensitive Skin & Stomach food comes in either herring and rice or lamb and rice. The formula is extremely high protein – 40% is what’s advertised. And supposedly the rice is easily digestible and Omega-6 fatty acids and zinc help sensitive skin felines with healthy skin and coat. The sensitive stomach seafood medley by Halo is supposedly made with real, whole whitefish – no rendered meal meat like fish meal. Marketed as including salmon, grains, non-GMO vegetables, as having no growth hormones or antibiotics, no artificial flavours, colours, or preservatives, and no factory farming. Marketed as featuring real de-boned chicken meat as the #1 ingredient, and contianing whole grains, garden veggies, and fruit. Marketed as not containing chicken or poultry by-product meals, nor corn, wheat, soy, artifiical flavours or preservitves. In terms of the sensitivity resolution, Blue’s Sensitive Stomach Adult Cat Food is marketed as being specially formulated with FOS prediction to help promote nutrition absorption and support digestive health. This cat food contains chicken as the main ingredient and contains turkey as well. It’s marketed as having a tailored fiber blend including prebiotics and beet pulp to support feline ability to absorb nutrients. Advertised as helping reduce plaque build up with its crunchy cat kibble texture, and being formulated with highly digestible proteins that promote long-term digestive health. This wet sensitive stomach and skin cat food comes in either chicken and vegetable, or tuna and vegable. Both are advetised as containing a blend of omega-6 fatty acids and other nutrients to keep a cat’s skin and coat well-nourished. It’s a pate marketed as being made with easy-to-digest ingredients. 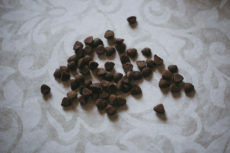 Like many of the dry cat foods, it’s advertised as having no artificial colours, flavours, or preservatives. 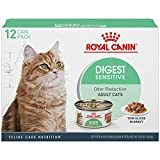 Royal Canin’s Digest Sensitive wet food is a gravy canned cat food that’s marketed as having a highly digestible formula that supports ideal weight maintenance, reduces stool odour, and promotes a healthy urinary system by reducing the concentration of minerals that can lead to urinary stones. It’s marketed as containing all the necessary nutrients for optimal health and vitality. 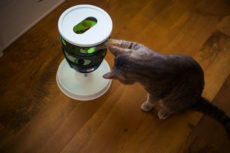 Halo’s Grain Free Sensitive Stomach Cat Food comes in many varieties, including: chicken, egg, and garden greens, quail and garden greens, guinea fowl and garden greens, and rabbit and garden greens. Marketed as being made with real whole poultry rather than meal meat, as being highly digestible with a taste and aroma cats love, and having no artificial colours, flavours, preservatives, as well as containing non-GMO vegetables and being kept in BPA free cans. Thoughts on Cats with Sensitive Stomachs? 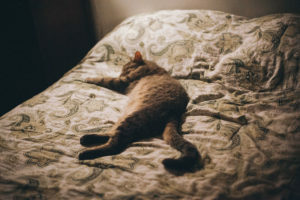 Has your cat or a cat you know ever vomited bile on empty stomach, had digestive issues, sensitive stomach problems, loose stool, or even had sensitive skin? If yes, what was the issue? Did you end up trying to fix the issue with a sensitive stomach cat food? Which brand(s) did you try and what was the result? Absolutely would love to hear any and all experiences you’ve had related to the topic of digestive issues, sensitive stomachs, cats vomiting (bile or meals), soft stools, etc. I know it’s not particularly a “pleasant” topic to discuss, but I’m sure absolutely all pet owners who happen to be in this type of situation right now would be incredibly grateful if you took the time to share your thoughts. You could really be helping a pet (or two or more!) out an incredible amount with your tips! I too have a cat that would spit up bile and had soft stool and always hungry. For 5 years been trying to find something even tried probiotics. Finally tried Hills Sensitive stomach and Skin. First serving no more anything!!! I leave a dish of food out always. I heard that cats are grazers. Constantly munching and we don’t have any weight issues. Thanks Hills Science!! Ya know, Angel tends to spit up small bits of bile. When Chuck was alive, we fed him and Angel a few times a day. When Chuck left us, we went back to twice a day feedings. 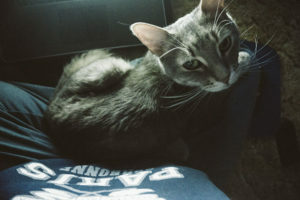 The Hubby is the one who is home; wonder if I suggest that he feed Angel a small amount midday…hmmm. That’s a good idea. If he can do that, it may solve it completely like it did with Avery. Especially if the “usual time” she spits up bile is in the evening right before meals. I always felt Avery would get a sense that the time to eat is coming, and it would make his metabolism kick into overdrive, and that would cause the acidity to build up (not sure if this is true, but it’s what I thought), and so if I fed him between the two feeding times, this would no longer be an issue since there would still be food in his stomach to digest. It did seem to work out that way.